Should the [triangle-generation] tag be removed, as it has three bad sides? triangle-generation attracts very different questions, mostly of low quality. Some talk about OpenGL, some talk about putting triangles as markers into plots, others about drawing ASCII art triangles, then there's the occasional basic math question. I would have expected some vertex shader discussions, too. I recommend removal of the tag, since it bears little benefit and is what pops up when askers type in "triangle" in the tag field -- and usually, it would be more helpful if they were discouraged to use a tag that "sounds similar" to their problem, and used one that covers the topic better, e.g. computational-geometry. The tag triangle-generation is quite ambiguous and warranted burnination. It had no tag summary initially. The tag had a lot of bad questions. Most of them were "gimmetehcodez" questions that were posted 4 to 5 years ago. Many were resource requests. It also included a self-immolation attempt. All these issues have been taken care of. Few of the questions which were good have been re-tagged to more relevant tags. Not the answer you're looking for? 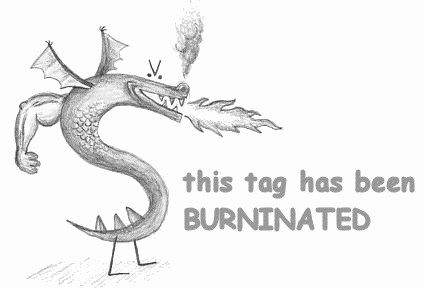 Browse other questions tagged discussion status-completed tags burninate-request tag-disambiguation . The [user] tag has been burninated! Should the corners tag be burninated (removed from all questions)? Should the [checker-board] tag be removed?